Seventeen hours of video training on demand: a complete, easy video course for every professional developer who wants to master C++! – Start-to-finish personal training on C++ object-oriented programming from worldclass trainers Deitel and Associates: just watch and learn! 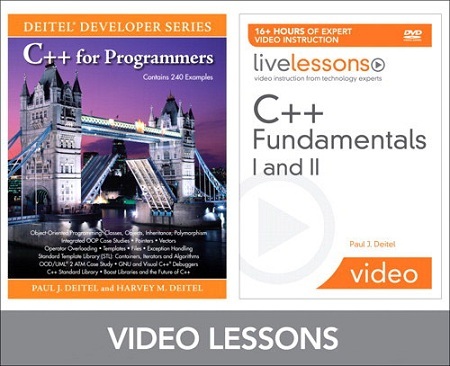 – Step-by-step video walkthroughs take developers from basic syntax through advanced techniques, using the Deitels’ proven “Live Code” approach – Great classroom training at a fraction of the cost…for pros who don’t have time to read a book Summary C++ Fundamentals I and II: Video LiveLessons is the only C++ video training delivered on DVD for the packaged product market. # Start-to-finish personal training on C++ object-oriented programming from world-class trainers Deitel and Associates: just watch and learn!